IIVA trainers aim to provide Abacus Teacher Training programme in such a unique simplified way that learning Maths becomes easy and fun for the learners. Also, our course fee includes all required study material which helps the learner to understand and learn in a better way. IIVA certified trainers can grab the earning opportunity and can open their own educational training institutes. 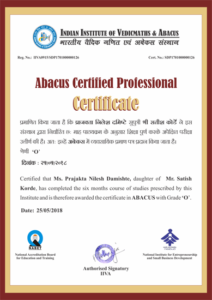 With a very small amount of investment in ABACUS certification, anyone can become a certified professional and get recognition in society. Last but not the least, IIVA does not force its learners to obtain franchise registration prior to starting their own classes. Without any hassle for becoming a franchise, IIVA provides an unmatched opportunity to become a professional. This is a 6-month syllabus which can be completed by the candidate in different time slots. Professional teachers can come twice a week while the homemakers and freshers can complete the course by coming 5 days a week. 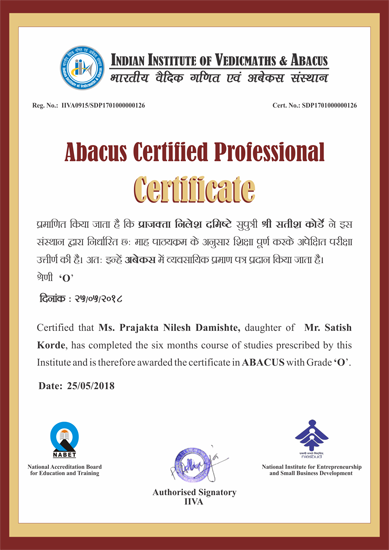 Who Can Join Abacus Training Programme? IIVA gives you an opportunity to train children with abacus technique based on the mental arithmetic system. IIVA is an Indian company which offers you one-time training at all levels and topics so that you are committed to quality and focus on excellent education. “Our program is not only a cognitive method but as well a skill of handling fast and mental calculations”. This training system provides unmatched solutions to each and every child Hidden magic is there in this friendly environment for those who have fear of maths. Learning abacus will remove their fear of maths. “Our Abacus approach is a language which plays with numbers for children to sense, feel and know”. This is a method of imaging and visualising numbers and deals with its addition, subtraction, multiplication, division and other operations mentally. Mental calculation training methods challenge children’s brains to improve their concentration, visual memory, listening speed, reasoning, logic, comprehension and offers right brain stimulations for creative intelligence. The general perception about Abacus and Vedic Maths is that it is all about numbers and speed. But Abacus enhances focus, concentration and also develops the synergy of the left and right brain. Duration of the course is 6 months and Short term crash courses are also available.